Stunning from every angle, an interior of unparalleled quality, and that glorious W12 powerplant. Making its official live debut here at the Frankfurt Motor Show is the all-new Bentley Continental GT. In short, it’s absolutely stunning. Thanks to an aerospace technique called Superforming, which requires heating aluminum to 500 degrees Celsius (932 degrees Fahrenheit), the body features brilliant curves and a sculpted character line extending from the front fender through the door. From there, the rear fender’s character line takes over. But it’s also the little styling bits that matter. For example, the front headlight’s inner crystal glass design was inspired by a whisky glass. Power, of course, comes from Bentley’s famed W12, only it’s more powerful than ever. The 6.0-liter twin-turbo unit is good for 626 hp and 664 lb-ft of twist. It is the world’s most powerful twelve-cylinder engine and comes paired to an eight-speed dual-clutch gearbox. With a claimed 0-62 mph time of 3.7 seconds, Bentley is confident this big coupe can hit a top speed of 207 mph. Compared to its predecessor, it’s 176 pounds lighter, thanks to greater use of aluminum and other lightweight materials. Also notice the stance; it’s a bit more planted than before thanks to the front wheels being shifted forward and pushed to the sides. 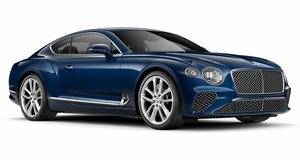 The overall exterior design is totally evolutionary, including everything from Bentley’s signature front grille to the raked back roofline at the rear. The interior is a true work of art. Aside from the luscious leather and “diamond in diamond” quilt stitching and 20-way adjustable seats with massage function, is the industry-first Bentley Rotating Display. When the 12.3-inch MMI display isn’t in use, the system "switches" to a veneer base, blending the area in with the rest of the dash. The third option features three gauges essential for driver feedback. Bentley claims a revised air suspension and electric power-assisted steering with a variable rack ratio that greatly improves overall handling. Expect the Continental GT to arrives in dealerships in the coming months.